why does this word seem to carry so much power; so much influence; so much fear; so many guidelines; so much heartache? 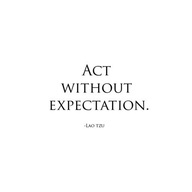 i can think back to thoughts, interactions, and happenings and recount numerous times that expectations have NOT been met/achieved. they don’t all deal with just me, it’s my expectations of others, too. 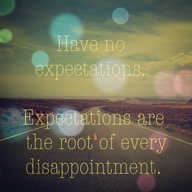 this is such a conflicting term because disappointment seems to be the product of expectations, almost always. if i succumb to the thoughts of discontentment with the expectations of others, i have ultimately hindered the chance to achieve personal expectations; i’ve stepped out of line in the responsibilities God has made clear are mine; i’ve neglected to let the love of Christ shine in my life, because of disappointment. i think the only solutions to this problem is solved by simply suppressing my ego and trusting God to meet my expectations, instead of relying on others or myself to do that. the other night at Mosaic, some lyrics from a song we sung, hit me hard, and are what gave me the answer to this conflicting issue of expectation. here, i have been reminded of the most amazing thing; that God never fails. right now, in my life, what i know i need is to trust God to fulfill my expectations; whether they are in others, or in myself. without a doubt i know that He can satisfy anything i think i need through myself and others. will this be a constant battle? yes. am i ready to stop letting disappointment dictate my life? yes. will i instantly be at peace about the expectations of myself and others not being met? no. this will be tough. this will be a challenge. but i am ready to get over myself, and get over the fact that other people are not what i want them to be. 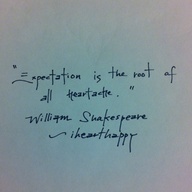 how do you feel about expectations?